Right now, you can get a One-Month Free Trial to Redbox Instant by Verizon with a subscription (or “with sign up”). 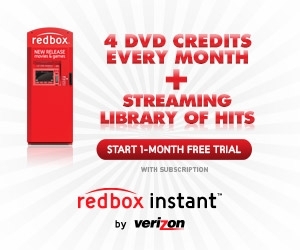 Receive access to a Streaming Library of Hits and 4 DVD Credits every month for rentals at your local Redbox kiosk. Once your free trial expires, membership costs $8 per month plus taxes. That matches Netflix’s Unlimited Streaming package. Stream movies wherever you are! They have thousands of newly released movies available. If you haven’t heard of Redbox Instant before, this would be a GREAT way to check it out. Sign up today for FREE!